Annisquam Herb Farm: Yummy honey . . .
Yummy honey . . .
We had so many insects pollinating this year I thought, "We should have a bee hive". Maybe the best way to have local honey is to buy honey from a local beekeeper or have someone place a hive here in exchange for a bit of honey. So far no offers! Now we have a beautiful bee hive made by Mr. O from plans for a Warre hive, as you can see in photo to the left. It has two of the three sections on the base at the moment. By spring the wood will have mellowed and the hive will be relocated to a better place. And we hope it will not end up as a garden ornament! Having a hive is just a small step to harvesting honey, I know! Honey is good for many things. It is used as a sweetener, in cosmetics and herbal medicine, for example. Honey from your area is beneficial to those who suffer from allergies in your area. Looking for more ways to use honey? 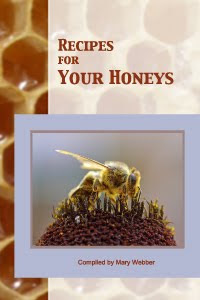 Recipes for Your Honeys, compiled by Mary Webber, has over two dozen recipes using honey for all kinds of dishes from meats and veggies to desserts - lots of tidbits and interesting information too. Don't have a PayPal account? Use your credit card or bank account (where available) once you get to PayPal.